Despite the rancor in the Republican presidential primary, the Colorado GOP U.S. Senate primary shows the ideological and demographic diversity within the Republican party. This was on full display in last night’s U.S. Senate debate hosted by 9News and the Lincoln Club of Colorado. 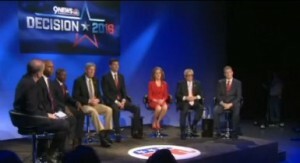 Eight of the candidates participated in the debate – Robert Blaha, Ryan Frazier, Jack Graham, Darryl Glenn, Jon Keyser, Peg Littleton, Jerry Natividad, and Tim Neville. Blaha, Frazier, Graham, and Keyser have turned in signatures to make the ballot. Glenn, Littleon, Natividad and Neville hope to make the ballot via the State Assembly on Saturday. Because each would need to receive 30 percent of the vote to make the ballot, it would be impossible for all to move forward in the process. With four competing for votes at the State Assembly, it is possible that just one or two will receive the required 30 percent to make the ballot. Thus, it’s likely that this field will shrink significantly on Saturday. Nonetheless, for those who claim that the Republican Party is an old, white man’s party. This crop of Senate candidates featuring old, young, white, Hispanic, black, female, pro-life, pro-choice candidates proves them wrong.